Limited sheet metal box including disc, 8-page booklet and sticker. and a CD-ROM section also featuring tracks from the first tape ("Devil's Hand", "Into The Ground", "The Beast Within", "Obsession"), live track ("Nervous") - all in WAV format (11 kHz / MONO), two videos ("Slashed Open" videoclip and "Last Walk" performed live) plus band bio and photos. The durations are not listed on the release. 1st Tape rec. + prod. on 4-track at home. GARGOYLES TAPE rec. + prod. at DANSE MACABRE STUDIOS, Bayreuth. NEW Songs rec at AUSFAHRT STUDIOS,HALLE, WESTFALEN. LIVE TRACK rec. KNAAK-CLUB BERLIN. Here we would like to say thank you to B.Kramm, S.Ackermann, R.Ettler + E.Stieg. 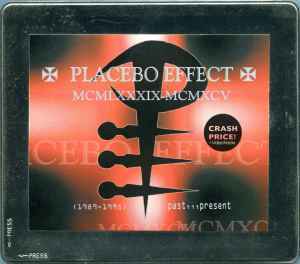 They have supported us just in the first days of forming up "PLACEBO EFFECT". Thank you for the great production, help + the power to work on. CD PLUS for CD-PLAYER + PC contains new songs, the history of the band, video bonustracks + many, many photos. cd+ format for cd player + pc.